The last blog shared some stark realities about the unfair subsidies that agricultural properties receive. One of these subsidies is agricultural properties paying less than owner-occupied properties when they have the same assessed value. Now let’s see what would result if, in fairness, agricultural properties paid the same tax rate for education as owner-occupied properties and our schools received the millions in funding they were deprived of because of greed. State-wide, South Dakota school districts would have receive nearly $78 million in additional funding this year if agricultural properties had paid the—still reduced—owner-occupied tax levy (click here to read the last blog post for a full exploration of how this number was determined). * The diverting of funds from capital outlay is something that state law currently allows, but the ability to do so will sunset in 2018. So if we want to keep paying teachers at their current salaries, we will have to find another source of funding by then. Had agricultural properties paid the same tax levy as owner-occupied properties for education, every school district could have received an additional $597.59 per student. 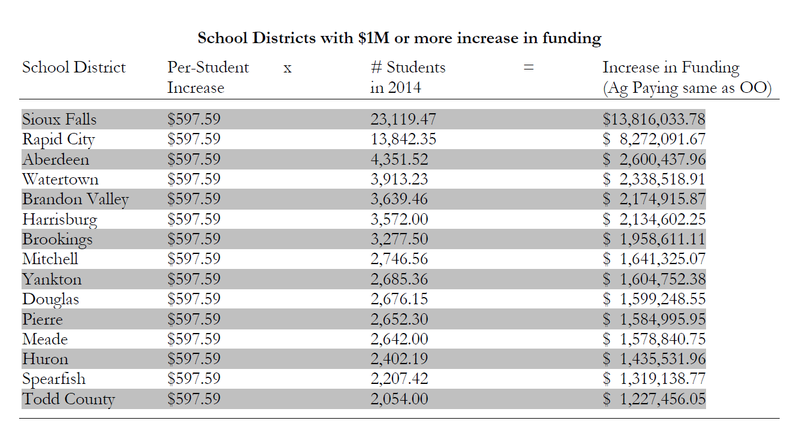 For the following school districts, that additional $597.59 per student would have meant more than $1 million in additional funding. Many South Dakota school districts have, in desperation for additional funding, chosen to opt-out. Below is a chart showing how the increase these opt-out school districts would have received had agricultural properties paid the same mill levy as owner-occupied, compared to the amount raised through the opt-out. For eighteen of the opt-out school districts, the increase in funding from agricultural properties paying a fair tax rate exceeds the amount raised through the current opt-out. An additional thirty opt-out school districts could have funded 50% to 96% of the need currently paid for through an opt-out. The people of all opt-out school districts would have had the opportunity to decide if they wanted to scale back their opt-out—and many may never have had to opt-out in the first place. As the increased funding each school district would have received this year was calculated by allocating funds per-student, the twenty-eight opt-out school districts which could have funded 50% or less of the need currently paid for through an opt-out are all small districts. Of these school districts, the largest has 314 students and the smallest has just six students. For Rapid City, an additional $8.3 million for education would mean a big step towards no longer treating the unacceptable as if it were, in fact, acceptable. It would mean a step towards honoring the obligation to educate our youth—the future voters and leaders of our community and our country—in spirit and not just meeting the letter of the law. It is time to realize that we must make a greater investment in our children’s education. Stay tuned for how the rules of the legislature can make this happen.